Building HoloLens apps is more fun when you have models. I mean… spheres and cubes have their place, but it’s decidedly more fun to be able see models that look like real things in your HoloLens app. And for that you’ll probably need some modeling software. If you’re just getting started, SketchUp is a great and simple 3D modeling tool. 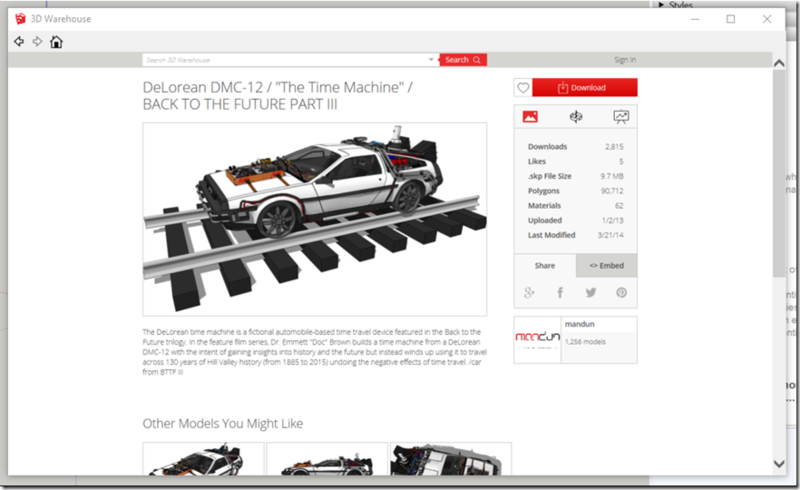 I highly recommend going through the tutorials but even if you don’t want to commit that kind of time, you can still get started with some pretty cool models through the SketchUp 3D Warehouse. 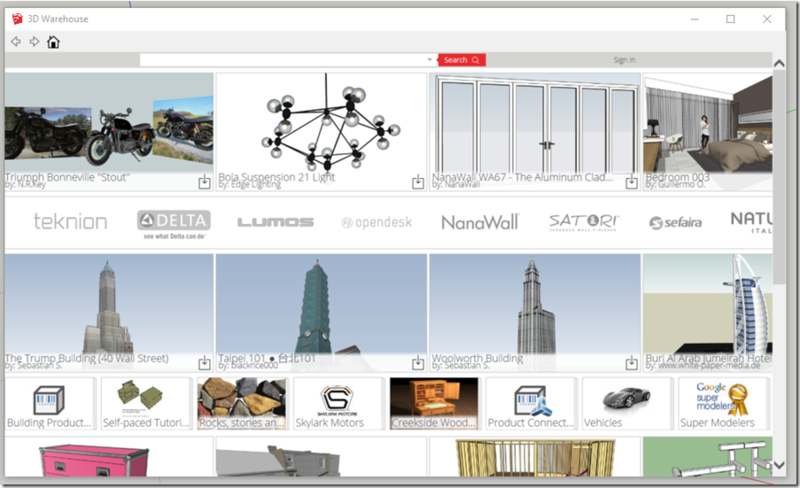 Go to Window –> 3D Warehouse to open up the model browser. You can search for a model or just scan through the categories. SketchUp has a lot of architectural models as well as furniture & vehicles. Pick the model you want to see as a hologram. Click the Download button and you will get a dialog that asks if you want to load it directly into your SketchUp model. Select “yes” and the model will load into your model space. Resize the model according to how large you want it to be compared to the HoloLens user. You can just eyeball this… we’ll do a more precise re-sizing in Unity. Now delete the little cartoon handy-woman and export the model as an FBX. When you have a new project up, navigate in File Explorer to the folder where you exported your FBX file. Drag the FBX file into your project assets. This should load it into your scene. Now comes the fun part: It’s common for sizing to be an issue with HoloLens apps. When I loaded this model in, it was unreasonably small. My solution for this problem is to create a cube that matches a dimension that I know I want (in this case, I used a schematic of the Delorean car) and scale the model to that dimension. Keep in mind that the units in Unity will correspond roughly to meters in the “real world” when you see the objects through the HoloLens. So if the Delorean is 1.14 meters tall, I create a cube with a scale of 1.14 and place it alongside my model. Scale the model to fit that dimension and then set the other scales to be the same. When your model is the right size, you can build it to see it in the HoloLens. Make sure you visit the post on getting your Unity project ready for HoloLens deployment.